Expecting Success: How do the top players rank at the end of April? Reading Ron Shandler’s story at USA Today yesterday, Fantasy’s First Round Has Been Filled With Busts, I realized in my recent series looking back at how fast starters and slow starters in April 2013 performed over the whole year, that I never looked at how the best players might do in April. And what that meant for the year as a whole. Ron says two of the Top 15 this year were actually in the Top 15 at the end of April. That would be No. 15 Troy Tulowitzki (ranked 4) and No. 3 Paul Goldschmidt (ranked 13). So how did things rank last year? At the end of the first month in 2013, three players ranked in the Top 15 at the end of April. No. 13 Justin Upton ranked No. 1, No. 6 Robinson Cano ranked 10th, and No. 1 Miguel Cabrera ranked fourth. Worst off was number 10 ranked Giancarlo Stanton, who ranked 244th. For the season as a whole, however, five of the preseason Top 15 finished in the Top 15 at the end of the year. Which goes part way toward explaining why we pay these guys the most. The ranks include all players from last year, so some of these are illogically low. Perfectly good for ranking in the top 500 or so, but not reliable below that. It is perhaps telling, too, that three of those Top 15 finishes out of the second group came from Cliff Lee, as did one End of Season finish in the Top 15 (h finished 12th). We’re not perfect predicting, not by a long shot, but the interesting thing here is not only how infrequently we get thing right, but how frequently we get the rank kind of right overall. It’s that sliver of success that gives better players value. This entry was posted in Data, Prices, Projections. Bookmark the permalink. I'm writing the ultimate Guide to playing Fantasy Baseball, and this site is my place to introduce and test ideas. Most of the writing will appear for a short period for free on the front page, but if you become a supporter and buy your copy of Rotoman's Guide to Fantasy Baseball now you'll help the project, get an inside look at its development, and have access to everything here while I'm writing it. To become a supporter visit the Supporter Page. Projecting X is Mike Podhorzer's excellent description of how he makes his very successful player projections. You can learn more about it at projectingx.com. Some Category Valuation Observations for Roto Pricing | Rotoman's Guide on Top 10 Most Misunderstood Fantasy Baseball Concepts: #8. Post Season Dollar Values. 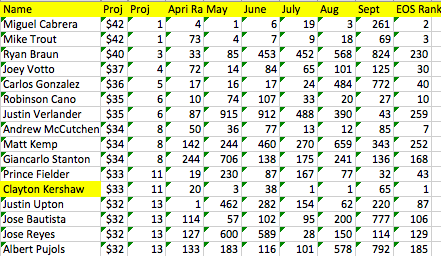 Comparing the 2015 Tout Auction to 2015 Tout Draft’s Dollar Values. What? How Much A Difference Does Moving From BA to OBP Make? Too experienced to summarize. Read on.